2015 Canadian Winter Drilling Season is over. Drilling activity is 45% down from last year. For some of our clients sales are 70% down. Some oil companies cut drilling programs, others ask for significant discounts. It’s not new for oilfield. We had that before. Experts say that this oil crisis is different from 1986, 1998, and 2008. Yes, it should be that way! Oil and Gas Industry develops in cycles. We have different industry structure, more advanced technology and experienced people now. Many of our clients are facing significant issues as a result of the recent decline in commodity prices. We prepared the 2015 Oilfield Service and Rentals Action Plan which will be useful to your organization as you navigate the low price environment. We stand for oilfield and believe that good times will come! Stay calm and have an Action Plan. If you need any assistance with your Downturn Action plan feel free to conact us. Our approach will allow you to navigate the down-cycles and be better positioned for the up-cycles. All questions on the Downturn Action Plan should be e-mailed to RigER Sales. Download 2015 Oilfield Service and Rentals Action Plan. 2. Oil and gas firms should and will work with engineers, geologists and drillers to develop dashboards that will help in developing certain fields. 3. By the end of 2017, 80 percent of the top oil and gas companies will reengineer processes and systems to optimize logistics, hedge risk and efficiently and safely deliver crude, liquefied natural gas and refined products. 4. Over the next three years, 40 percent of oil and gas majors and all software divisions of oilfield services will co-innovate on domain specific technical projects with IT professional service firms. 5. By 2016, 70 percent of oil and gas firms will have invested in programs to evolve their IT packages and third-party platforms that help in changing commodity price environments. 6. With continued labor shortages impacting oil and gas workforce, firms will look to IT to meet productivity goals. 7. 100 percent of top 25 oil and gas firms will use modeling and simulation tools to optimize field development programs by the end of 2017. 8. Spending on connectivity-related technologies will increase by 30 percent between 2014 and 2016. 9. As mergers and acqusitions happen in 2015, 40 percent of oil and gas companies will look to reevaluate hydrocarbon accounting practices. 10. By 2016, 50 percent of oil and gas firms will have advanced analytics in place. Roughly one-quarter of the top 25 firms will apply intergrated planning and information to large capital projects by 2015. 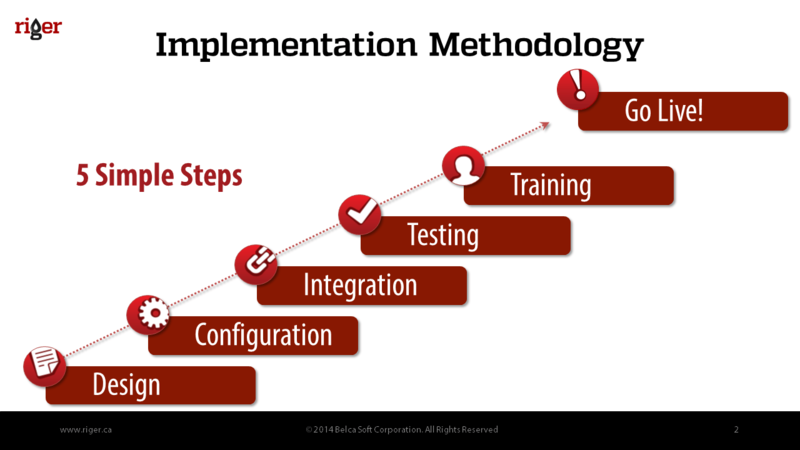 BelcaSoft is pleased to introduce RigER Implementation Methodology. We use 5 Simple Steps to successfully implement Oilfield Service and Rental Operations Management Software. Boost Oilfield Rentals with RigER! Implement RigER to you day-to-day operations! Spreadsheets for Oilfield Service and Rentals Tracking! Really? Have you ever tried to control your shop inventory in a spreadsheet? How about rental days count? It is not easy. In fact, it is almost impossible. The reason is obvious. Spreadsheets are static and not designed for dynamic tracking. They will never work as logistics, warehouse and rental software. In spite of this, spreadsheets, e-mail and paper-based systems are currently widely used in oilfield service industry. Many small and medium size companies use them to track oilfield rentals. This has led to major problems as companies grow and more people need to access the spreadsheets that show rental units availability and locations, service periods, utilization and profitability. Multi-user mode in spreadsheets is another story. We heard many stories of lost or forgotten equipment caused cash loss and put safety at risk. The industry reports big chunk of time and resources being spent to retrieve information from spreadsheets. And the more company grows, the more complicated it becomes. We once found 152 errors in one spreadsheet. The spreadsheet had been in use for a long time and the validity of the data had gradually decayed. In general, many spelling errors and incorrect references resulted in the spreadsheet being considerable economic and operational risk. The Wall Street Journal recently published even worse case – Spreadsheet Mistake Cost Tibco Shareholders $100 Million. Learn more about our solution for oil and gas industry here. We prepared new infographics about Drilling Rigs in Western Canada. It shows Canadian oilfield features: drilling allocation by provinces and seasonality of drilling in Western Canada. ERP is the part of the interlinked processes that make up the total business and financial impact. Almost all the typical application systems are nothing but the data manipulation tools. They store data, process them, and present them in the appropriate form whenever requested by the user. In this process the only problem is that there is no link between the application systems being used by different departments. Today acronym ERP is used in different meaning. We would like to explain what we mean by ERP and what is our vision of ERP future.